II developed FabPCBMaker as a final project for Fab Academy 2017. 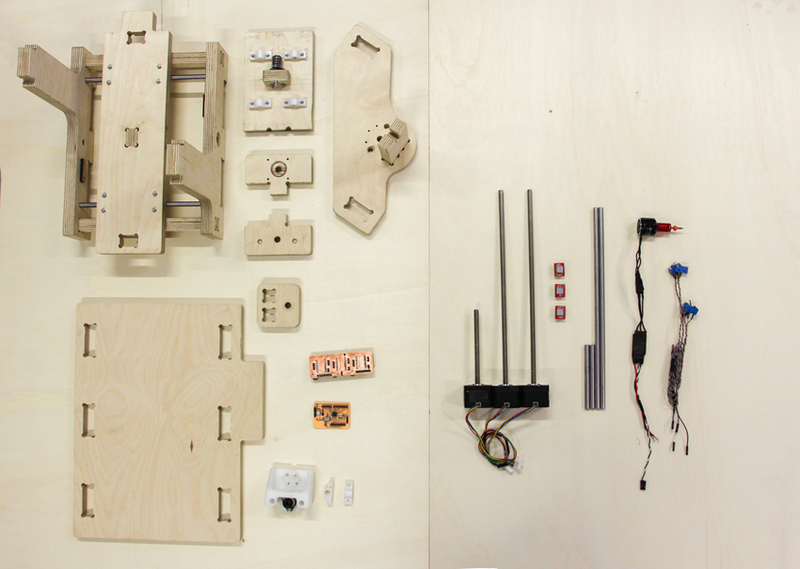 The idea was to make it possible to construct a CNC mill for PCBs (printed circuit boards) in a FabLab for as little money as possible (less than 100 euros ideally). My approach was to use easily accessible materials: that’s why I decided to make the frame of the machine out of wood. One of the motivations behind this project is that PCB milling is much better for the environment than acid etching. I used fusion360 to design everything and the CNC machine to produce the parts. I used my own electronics based on an open source microcontroller board along with the grbl firmware to control the machine. It took almost 4 months (March-July 2017) to design and build the machine. The idea of a CNC that’s made out of wood might sound a little crazy, but the final result is impressive! Today we use my construction and offer the construction of the milling machine in a student workshop.